Chinese Ambassador Cheng Xueyuan and National Integration, Official Languages, Social Progress and Hindu Religious Affairs Minister Mano Ganesan along with officials after the discussion. Chinese Ambassador Cheng Xueyuan agreed to advice Chinese entrepreneurs to respect Sri Lankan language laws when they display sign boards at Chinese worksites in Sri Lanka, National Integration, Official Languages, Social Progress and Hindu Religious Affairs Minister Mano Ganesan said. 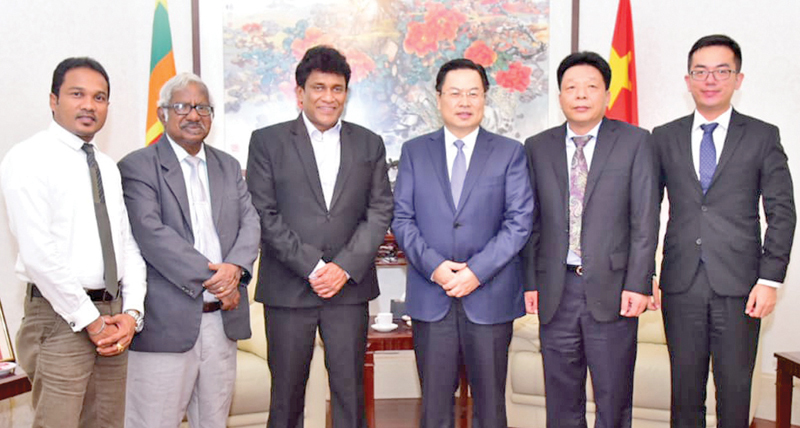 Following the controversial signboard of the Metro Colombo Solid Waste Management Project at the Sanitary Landfill site in Aruwakkalu, Puttalam, the Minister met the Chinese Ambassador on Friday. The name board which displays its message in Sinhala, English and Chinese language came under flak in the social media platforms for using Chinese instead of Tamil violating the language policy of the country. Minister Ganesan was quick to express his displeasure over the sign board, stating that the Chinese in Sri Lanka should respect the local laws. The Minister later tweeted that his ministry has initiated action against the name board. “We cannot tolerate violations of local language laws at Chinese sites in Sri Lanka. We wish to provide assistance if any required by them when putting up sign boards. We also plan to engage with all relevant authorities including the Chinese Embassy in this regard,” he said. The Minister said that in a cordial discussion on Friday, the Chinese Ambassador sought his ministry’s assistance in translating the parts in Chinese on the board into Tamil.